Meet Dr. Mel Falk, one of the six finalists in the Pets Best Summer 2014 round of the My Vet’s the Best Contest. Pets Best, a leading U.S. pet health insurance agency developed the contest to recognize the country’s best veterinarians. Each year, thousands of veterinarians receive nominations from grateful pet owners. Dr. Falk grew up on a farm in the tiny town of Alta Vista, Kansas. He developed a love for animals and knew he wanted to be a veterinarian at a young age. In 1974 he graduated with a degree in veterinary medicine from Kansas State University, and then made the move to Independence, Missouri. 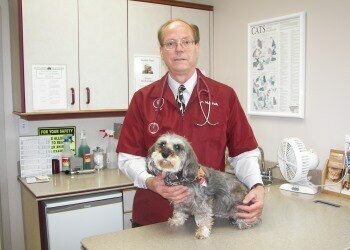 Dr. Falk was a small animal practitioner for many years before opening his own practice. Researching the latest tools and hospital designs in modern veterinary medicine, his dream became a reality in 1993 when he opened his own clinic, Hidden Valley Animal Hospital. Dr. Falk is a very involved member of his church, Timothy Lutheran Church, and he’s also a member of several veterinary associations. He enjoys spending free time with his wife of more than 30 years, their four sons, and six grandchildren. To vote for Dr. Falk or any of the finalists, click here. Vote once a day through August 10th, 2014. To nominate your favorite veterinarian for future rounds of the My Vet’s the Best Contest, click here. To learn more about the My Vet’s the Best Contest, click here.